Meant as introduction to User variables: defining a user variable, how can it be used, how to remove/edit/check usage. This was a very specific but rare situation in Captivate: the variable needed for a TEB is created automatically, it has by default the same name as the TEB itself. There were two reasons to replace it: to recognize it easier in any dropdown list, and because I really don’t like to use the same name twice for two different items (the TEB and the variable), which in most situations is not a good practice, could cause problems. In that same post I also mentioned that two user variables are created automatically for each project: cpQuizInfoStudentName and cpQuizInfoStudentID. They can be populated with data from the learner’s account by some LMS’s and are used for reporting to an Internal Server. In all other circumstances you need to create user variables. User variables are defined using Project, Variables. 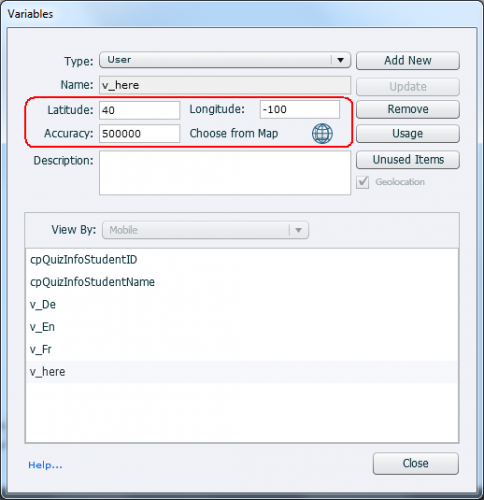 You’ll see the two default user variables cpQuizInfoID/Name and eventually variables defined with the TEB-workflow. To create a new user variable you click the button ‘Add New’. You could limit the definition to the variable name and clicking ‘Save’ button, but I strongly recommend to add a description as well. It makes it a lot easier to identify the variable when you have to edit the course weeks/months/years later. In this screenshot I still have to click the Save button or the ‘Discard’ if after all I don’t want this variable. You see in the screenshot that I left the Value field blank, because for these variables I didn’t need a default nor start value at all. Those variables will be linked to an interaction. As mentioned multiple times, the choice of the names is very important in Captivate. Except for some rare situations, you cannot use the same name for two or more different items (objects, variables, actions, ….). Using the first character(s) of the name to indicate the type of item is a way to avoid that. In most dropdown lists, you can use filtering to find a name (see the interactive video in Custom Play/Pause button). That makes the name choice even more important. Remove: if you want to clean up, check which variables are not used anymore after finishing the project and use this button. 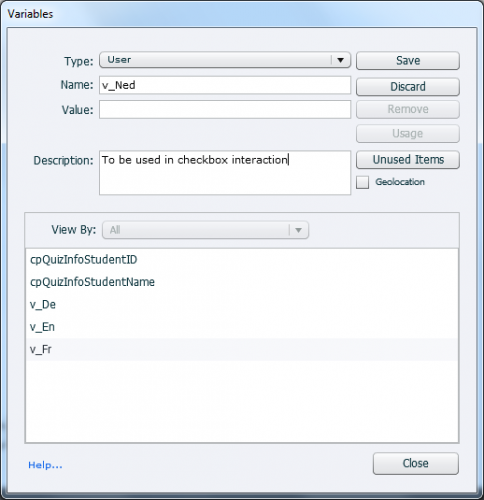 You can open the Variables dialog box from the Advanced Actions dialog box (see this article). In that case, the Remove button will be missing however. Usage: will list up where the variable is used. That will mostly be an action (simple/advanced.shared), can be compared with a similar button in the Library, and in the Advanced Actions dialog box. Unused items: also to be compared with a Library functionality. 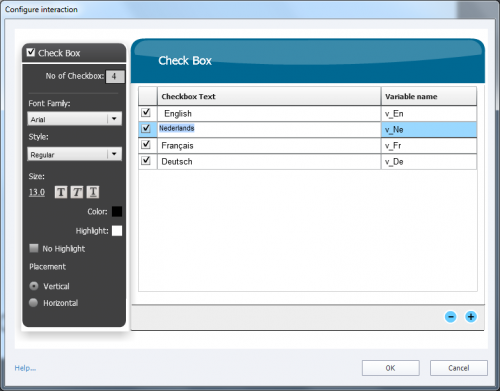 In the example of the dialog box, the two user variable cpQuizInfo…. would pop up. You can edit each field of a the variable dialog box, except the Name field. Do not forget to save the changes with the Save button in the top of the dialog box. Toggle: variable will be recognized as a Boolean variable. Its value will switch to the opposite value (0/1 or true/false). v_counter: often used to show the number of clicks, of visits (to a chapter), and/or to create a progress bar or show a ‘reward’. I use a shared action which I drag to each new course to avoid having to redefine these user variables. This is described in detail in the first tip in Rare Use of Shared Actions.